Measured stream flow and stream and lake concentration data have been used to construct total phosphorus and total nitrogen budgets for six lakes in the County. These budgets account for nutrient inputs from streams, septic drain fields, atmospheric deposition, groundwater, and release from lake sediments. These inventories have been used to estimate the relative magnitude and significance of each individual nutrient source for each lake. The results show that the majority of the phosphorus inputs to the lakes are the result of local pollutant sources and local watershed activities rather than uncontrollable atmospheric inputs. This means that future water quality conditions in the lakes will be determined by the activities of individuals and local regulations within the watersheds. The analyses presented here provide valuable insights regarding the possible impacts of various nutrient control strategies on lake water quality. The measured data and the nutrient budgets can be used to support the construction of water quality models for the lakes of Leelanau County. These models can be used to make quantitative predictions of the affect of specific developments in the watersheds on lake water quality. An example of these budgets is shown for South Lake Leelanau in the table below. Algae generally require about ten times more nitrogen compared to phosphorus for growth and reproduction. The N/P ratios of both the inputs and the outputs from South Lake Leelanau are well above ten, and therefore phosphorus is the limiting nutrient in South Lake Leelanau. 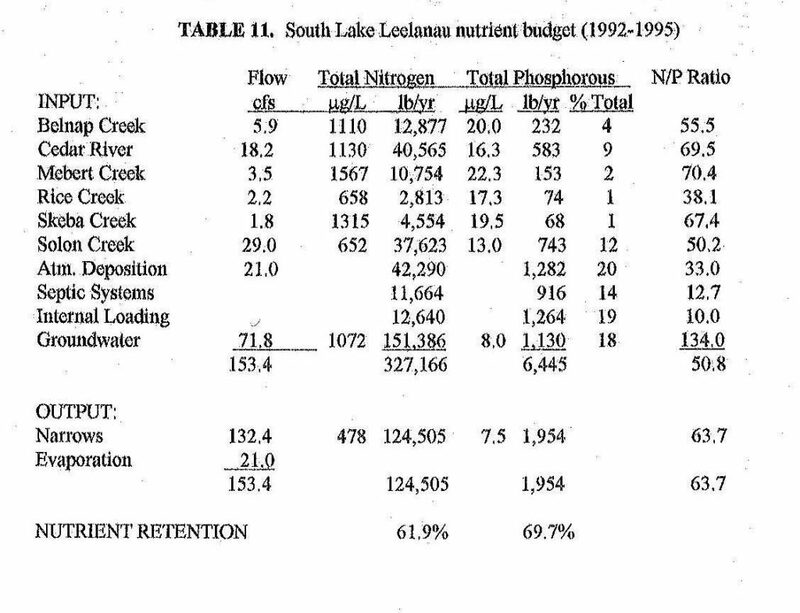 Approximately 70% of the phosphorus that enters South Lake Leelanau is eventually retained in the sediments. This value is consistent with observations from other lakes with similar water quality. Approximately 80% of the phosphorus input to the lake is from tributary streams, septic systems, groundwater, and lake sediments. This suggests that improvements or possible future degradations in lake water quality are strongly linked to local watershed activities.